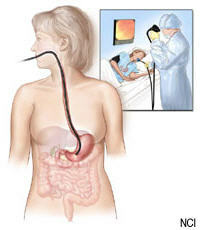 Endoscopy is a procedure that lets your doctor look inside your body. It uses an instrument called an endoscope, or scope for short. Scopes have a tiny camera attached to a long, thin tube. The doctor moves it through a body passageway or opening to see inside an organ. Sometimes scopes are used for surgery, such as for removing polyps from the colon. There are many different kinds of endoscopy. Here are the names of some of them and where they look.